Have an indoor campout with this mini campfire from Home Sweet Homebodies. These sweet snails from Learning Ideas Grade K-8 are made from rolled paper. Hmmmm, that gives me a great idea for a new quilling project! Stay tuned for that! Here is a paper boat from Rudy and the Dodo made from just two sheets. But trade the boat paper for tin foil and I bet it would really float! Our nights may be a lot quieter with these paper crickets from The Ramblings of a Crazy Woman. Mommyhood Craft Corner has shared this paper mache idea for a hot air balloon piñata! Genius! I love this paper mache watermelon bowl by Handmade Kids Art so much, I might make it without Moose & the Bean! I Heart Crafty Things created this paper plate fishy to match a book she was reading with her daughter. Cute! This kite craft by Little Family Fun is something my Moose would really enjoy. Kites have been catching his eye at the park lately. Tiny Rotten Peanuts created these giant paper popsicles that would be a great craft for the youngest crafters! 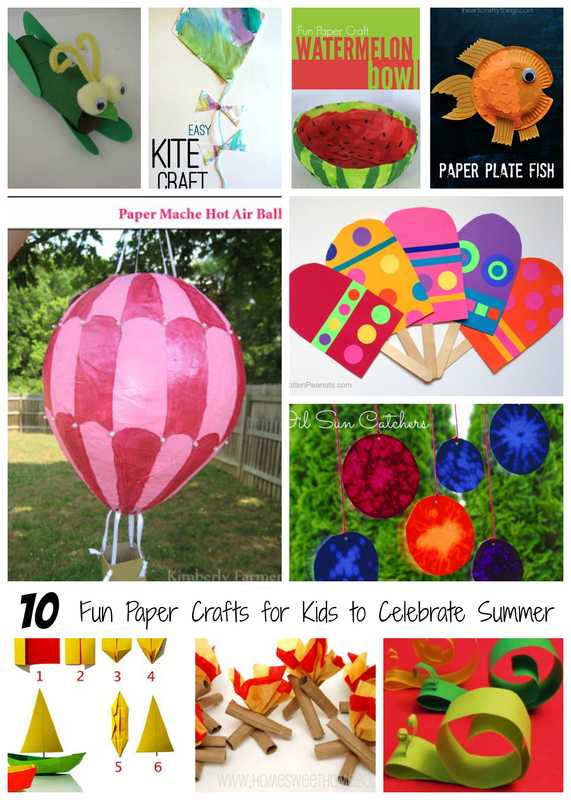 And how about using smaller paper popsicles as a garland for your summer BBQ parties? Here’s a great art/science lesson from Meaningful Mama just using oil and paper. Let’s keep all those little hands and minds busy on those super hot or rainy days. And share some of your own paper crafting ideas. What crafts do you have planned for your kids this summer? Good post. I find out one thing much more challenging on various blogs everyday. It will normally be stimulating to read content material from other writers and practice somewhat some thing from their store. I’d prefer to use some using the content material on my blog whether or not you don’t mind. Natually I’ll offer you a link in your internet blog.